What an absolute treat it was to attend the opening night performance of the West Coast Premier of Clybourne Park at A.C.T. 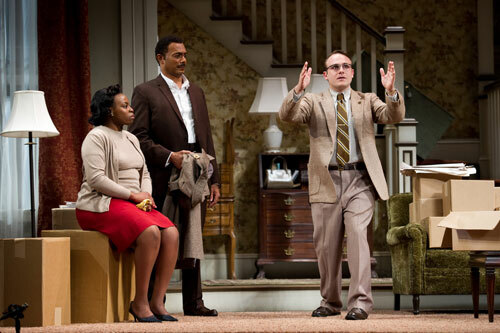 This play is an outstanding piece of writing and is bound to become an American classic. Reminiscent of Albee in style, you find yourself laughing hysterically at racist jokes, verbal and physical abuse, and severe political incorrectness. Neighborhood association representative Karl (Richard Thieriot, right) explains the differences between the races to Francine (A.C.T. Master of Fine Arts Program graduate Omozé Idehenre) and Albert (A.C.T. core acting company member Gregory Wallace). Photo by Erik Tomasson. The cast, all part of the A.C.T. core acting group, is outstanding. They nail the comedy and the irony of this play over and over again. Wednesday's audience all rose to their feet without hesitation at the conclusion of the performance. Jonathan Moscone, the Artistic Director of Cal Shakes directed this project and turned a great script into a perfect script, with his economic yet subtle direction. One thing I loved about this production is that the actors never moved around just for the hell of it. No one went anywhere unless there was a good reason. Actors often want to get up an walk around and often directors let them do it even if it dilutes the power of the words. That never happened in this production. In fact, Act II was nearly completely stationary. Most of the actors never left their lawn chairs. You MUST see this play. It is destined for greatness. I expect that it may win the Pulitzer and the Tony. It runs through February 20th. Get tickets here. Diane Tasca & Bill Jones in "No Good Deed"
The Pear Avenue Theatre in Mountain View, is now showing the world premiere of Paul Braverman's, "No Good Deed". Last night's performance was an absolute blast. Bravo to The Pear for daring to do something completely different. The show is written and performed in the style of "film noir", and surprisingly it shines. The performances were all outstanding and under the direction of Michael Champlin, the show has the perfect mix of true "film noir" mystique, and ironic humor to keep you entertained for a unique two hours of intimate theatre. The show runs through next Sunday.